One night -- it was on the twentieth of March, 1888 -- I was returning from a journey to a patient (for I had now returned to civil practice), when my way led me through Baker Street. As I passed the well-remembered door, which must always be associated in my mind with my wooing, and with the dark incidents of the Study in Scarlet, I was seized with a keen desire to see Holmes again, and to know how he was employing his extraordinary powers. His rooms were brilliantly lit, and, even as I looked up, I saw his tall, spare figure pass twice in a dark silhouette against the blind. He was pacing the room swiftly, eagerly, with his head sunk upon his chest and his hands clasped behind him. To me, who knew his every mood and habit, his attitude and manner told their own story. He was at work again. He had risen out of his drug-created dreams and was hot upon the scent of some new problem. I rang the bell and was shown up to the chamber which had formerly been in part my own. "Quite so! You have not observed. And yet you have seen. That is just my point. Now, I know that there are seventeen steps, because I have both seen and observed. By-the-way, since you are interested in these little problems, and since you are good enough to chronicle one or two of my trifling experiences, you may be interested in this." He threw over a sheet of thick, pink-tinted note-paper which had been lying open upon the table. "It came by the last post," said he. "Read it aloud." "There will call upon you to-night, at a quarter to eight o'clock," it said, "a gentleman who desires to consult you upon a matter of the very deepest moment. Your recent services to one of the royal houses of Europe have shown that you are one who may safely be trusted with matters which are of an importance which can hardly be exaggerated. This account of you we have from all quarters received. Be in your chamber then at that hour, and do not take it amiss if your visitor wear a mask. "I have no data yet. It is a capital mistake to theorize before one has data. Insensibly one begins to twist facts to suit theories, instead of theories to suit facts. But the note itself. What do you deduce from it?" "The man who wrote it was presumably well to do," I remarked, endeavoring to imitate my companion's processes. "Such paper could not be bought under half a crown a packet. It is peculiarly strong and stiff." "Peculiar -- that is the very word," said Holmes. "It is not an English paper at all. Hold it up to the light." "What do you make of that?" asked Holmes. "Not at all. The 'G' with the small 't' stands for 'Gesellschaft,' which is the German for 'Company.' It is a customary contraction like our 'Co.' 'P,' of course, stands for 'Papier.' Now for the 'Eg.' Let us glance at our Continental Gazetteer." He took down a heavy brown volume from his shelves. "Eglow, Eglonitz -- here we are, Egria. It is in a German-speaking country -- in Bohemia, not far from Carlsbad. 'Remarkable as being the scene of the death of Wallenstein, and for its numerous glass-factories and paper-mills.' Ha, ha, my boy, what do you make of that?" His eyes sparkled, and he sent up a great blue triumphant cloud from his cigarette. "Precisely. And the man who wrote the note is a German. Do you note the peculiar construction of the sentence -- 'This account of you we have from all quarters received.' A Frenchman or Russian could not have written that. It is the German who is so uncourteous to his verbs. It only remains, therefore, to discover what is wanted by this German who writes upon Bohemian paper and prefers wearing a mask to showing his face. And here he comes, if I am not mistaken, to resolve all our doubts." "You had my note?" he asked with a deep harsh voice and a strongly marked German accent. "I told you that I would call." He looked from one to the other of us, as if uncertain which to address. "Pray take a seat," said Holmes. "This is my friend and colleague, Dr. Watson, who is occasionally good enough to help me in my cases. Whom have I the honor to address?" "You will excuse this mask," continued our strange visitor. "The august person who employs me wishes his agent to be unknown to you, and I may confess at once that the title by which I have just called myself is not exactly my own." The man sprang from his chair and paced up and down the room in uncontrollable agitation. Then, with a gesture of desperation, he tore the mask from his face and hurled it upon the ground. "You are right," he cried; "I am the King. Why should I attempt to conceal it?" "Why, indeed?" murmured Holmes. "Your Majesty had not spoken before I was aware that I was addressing Wilhelm Gottsreich Sigismond von Ormstein, Grand Duke of Cassel-Felstein, and hereditary King of Bohemia." "The facts are briefly these: Some five years ago, during a lengthy visit to Warsaw, I made the acquaintance of the wellknown adventuress, Irene Adler. The name is no doubt farmiliar to you." "Let me see!" said Holmes. "Hum! Born in New Jersey in the year 1858. Contralto -- hum! La Scala, hum! Prima donna Imperial Opera of Warsaw -- yes! Retired from operatic stage -- ha! Living in London -- quite so! Your Majesty, as I understand, became entangled with this young person, wrote her some compromising letters, and is now desirous of getting those letters back." "Precisely so. But how --"
"Was there a secret marriage?" "No legal papers or certificates?" "Then I fail to follow your Majesty. If this young person should produce her letters for blackmailing or other purposes, how is she to prove their authenticity?" "I was mad -- insane." "Very, indeed. And what does she propose to do with the photograph?" "To Clotilde Lothman von Saxe-Meningen, second daughter of the King of Scandinavia. You may know the stnct principles of her family. She is herself the very soul of delicacy. A shadow of a doubt as to my conduct would bring the matter to an end." "Threatens to send them the photograph. And she will do it. I know that she will do it. You do not know her, but she has a soul of steel. She has the face of the most beautiful of women, and the mind of the most resolute of men. Rather than I should marry another woman, there are no lengths to which she would not go -- none." "You are sure that she has not sent it yet?" "Oh, then we have three days yet," said Holmes with a yawn. "That is very fortunate, as I have one or two matters of importance to look into just at present. Your Majesty will, of course, stay in London for the present?" "And Mademoiselle's address?" he asked. "Is Briony Lodge, Serpentine Avenue, St. John's Wood." Holmes took a note of it. "One other question," said he. "Was the photograph a cabinet?" "Then, good-night, your Majesty, and I trust that we shall soon have some good news for you. And good-night, Watson," he added, as the wheels of the royal brougham rolled down the street. "If you wlll be good enough to call to-morrow afternoon at three o'clock I should like to chat this little matter over with you." It was close upon four before the door opened, and a drunkenlooking groom, ill-kempt and side-whiskered, with an inflamed face and disreputable clothes, walked into the room. Accustomed as I was to my friend's amazing powers in the use of disguises, I had to look three times before I was certain that it was indeed he. With a nod he vanished into the bedroom, whence he emerged in five minutes tweed-suited and respectable, as of old. Putting his hands into his pockets, he stretched out his legs in front of the fire and laughed heartily for some minutes. "Quite so; but the sequel was rather unusual. I will tell you, however. I left the house a little after eight o'clock this morning in the character of a groom out of work. There is a wonderful sympathy and freemasonry among horsy men. Be one of them, and you will know all that there is to know. I soon found Briony Lodge. It is a bijou villa, with a garden at the back. but built out in front right up to the road, two stories. Chubb lock to the door. Large sitting-room on the right side, well furnished, with long windows almost to the floor, and those preposterous English window fasteners which a child could open. Behind there was nothing remarkable, save that the passage window could be reached from the top of the coach-house. I walked round it and examined it closely from every point of view, but without noting anything else of interest. "And what of Irene Adler?" I asked. "Oh, she has turned all the men's heads down in that part. She is the daintiest thing under a bonnet on this planet. So say the Serpentine-mews, to a man. She lives quietly, sings at concerts, drives out at five every day, and returns at seven sharp for dinner. Seldom goes out at other times, except when she sings. Has only one male visitor, but a good deal of him. He is dark, handsome, and dashing, never calls less than once a day, and often twice. He is a Mr. Godfrey Norton, of the Inner Temple. See the advantages of a cabman as a confidant. They had driven him home a dozen times from Serpentine-mews, and knew all about him. When I had listened to all they had to tell, I began to walk up and down near Briony Lodge once more, and to think over my plan of campaign. "This Godfrey Norton was evidently an important factor in the matter. He was a lawyer. That sounded ominous. What was the relation between them, and what the object of his repeated visits? Was she his client, his friend, or his mistress? If the former, she had probably transferred the photograph to his keeping. If the latter, it was less likely. On the issue of this question depended whether I should continue my work at Briony Lodge, or turn my attention to the gentleman's chambers in the Temple. It was a delicate point. and it widened the field of my inquiry. I fear that I bore you with these details, but I have to let you see my little difficulties, if you are to understand the situation." "I was still balancing the matter in my mind when a hansom cab drove up to Briony Lodge, and a gentleman sprang out. He was a remarkably handsome man, dark, aquiline, and moustached-evidently the man of whom I had heard. He appeared to be in a great hurry, shouted to the cabman to wait, and brushed past the maid who opened the door with the air of a man who was thoroughly at home. I was half-dragged up to the altar, and before I knew where I was I found myself mumbling responses which were whispered in my ear. and vouching for things of which I knew nothing, and generally assisting in the secure tying up of Irene Adler, spinster, to Godfrey Norton, bachelor. 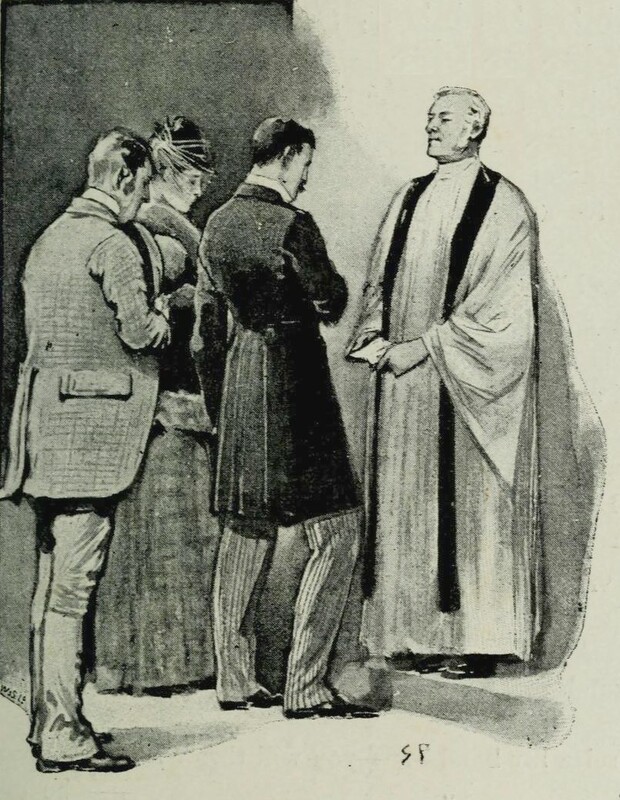 It was all done in an instant, and there was the gentleman thanking me on the one side and the lady on the other, while the clergyman beamed on me in front. It was the most preposterous position in which I ever found myself in my life, and it was the thought of it that started me laughing just now. It seems that there had been some informality about their license, that the clergyman absolutely refused to marry them without a witness of some sort, and that my lucky appearance saved the bridegroom from having to sally out into the streets in search of a best man. The bride gave me a sovereign, and I mean to wear it on my watch-chain in memory of the occasion." "This is a very unexpected turn of affairs," said I; "and what then?" "But what is it you wish?" "You must leave that to me. I have already arranged what is to occur. There is only one point on which I must insist. You must not interfere, come what may. You understand?" "I am to be neutral?" "And when I raise my hand -- so -- you will throw into the room what I give you to throw, and will, at the same time, raise the cry of fire. You quite follow me?" "It is nothing very formidable," he said, taking a long cigarshaped roll from his pocket. "It is an ordinary plumber's smokerocket, fitted with a cap at either end to make it self-lighting. Your task is confined to that. When you raise your cry of fire, it will be taken up by quite a number of people. You may then walk to the end of the street, and I will rejoin you in ten minutes. I hope that I have made myself clear?" He disappeared into his bedroom and returned in a few minutes in the character of an amiable and simple-minded Nonconformist clergyman. His broad black hat, his baggy trousers. his white tie, his sympathetic smile, and general look of peering and benevolent curiosity were such as Mr. John Hare alone could have equalled. It was not merely that Holmes changed his costume. His expression, his manner, his very soul seemed to vary with every fresh part that he assumed. The stage lost a fine actor, even as science lost an acute reasoner, when he became a specialist in crime. "You see," remarked Holmes, as we paced to and fro in front of the house, "this marriage rather simplifies matters. The photograph becomes a double-edged weapon now. The chances are that she would be as averse to its being seen by Mr. Godfrey Norton, as our client is to its coming to the eyes of his princess. Now the question is, Where are we to find the photograph?" "Her banker or her lawyer. There is that double possibility. But I am inclined to think neither. Women are naturally secretive, and they like to do their own secreting. Why should she hand it over to anyone else? She could trust her own guardianship, but she could not tell what indirect or political influence might be brought to bear upon a business man. Besides, remember that she had resolved to use it within a few days. It must be where she can lay her hands upon it. It must be in her own house." "But how will you look?" "She will not be able to. But I hear the rumble of wheels. It is hcr carriage. Now carry out my orders to the letter." As he spoke the gleam of the side-lights of a carriage came round the curve of the avenue. It was a smart little landau which rattled up to the door of Briony Lodge. As it pulled up, one of the loafing men at the corner dashed forward to open the door in the hope of earning a copper, but was elbowed away by another loafer, who had rushed up with the same intention. A fierce quarrel broke out, which was increased by the two guardsmen, who took sides with one of the loungers, and by the scissorsgrinder, who was equally hot upon the other side. A blow was struck, and in an instant the lady, who had stepped from her carriage, was the centre of a little knot of flushed and struggling men, who struck savagely at each other with their fists and sticks. Holmes dashed into the crowd to protect the lady; but just as he reached her he gave a cry and dropped to the ground, with the blood running freely down his face. At his fall the guardsmen took to their heels in one direction and the loungers in the other, while a number of better-dressed people, who had watched the scuffle without taking part in it, crowded in to help the lady and to attend to the injured man. Irene Adler, as I will still call her, had hurried up the steps; but she stood at the top with her superb figure outlined against the lights of the hall, looking back into the street. "Is the poor gentleman much hurt?" she asked. "He can't lie in the street. May we bring him in, marm?" Holmes had sat up upon the couch, and I saw him motion like a man who is in need of air. A maid rushed across and threw open the window. At the same instant I saw him raise his hand and at the signal I tossed my rocket into the room with a cry of "Fire!" The word was no sooner out of my mouth than the whole crowd of spectators, well dressed and ill -- gentlemen, ostlers, and servant-maids -- joined in a general shriek of "Fire!" Thick clouds of smoke curled through the room and out at the open window. I caught a glimpse of rushing figures, and a moment later the voice of Holmes from within assuring them that it was a false alarm. Slipping through the shouting crowd I made my way to the corner of the street, and in ten minutes was rejoiced to find my friend's arm in mine, and to get away from the scene of uproar. He walked swiftly and in silence for some few minutes until we had turned down one of the quiet streets which lead towards the Edgeware Road. "And how did you find out?" "Then, when the row broke out, I had a little moist red paint in the palm of my hand. I rushed forward, fell down. clapped my hand to my face, and became a piteous spectacle. It is an old trick." "Then they carried me in. She was bound to have me in. What else could she do? And into her sitting-room. which was the very room which I suspected. It lay between that and her bedroom, and I was determined to see which. They laid me on a couch, I motioned for air, they were compelled to open the window. and you had your chance." "How did that help you?" "It was all-important. When a woman thinks that her house is on fire, her instinct is at once to rush to the thing which she values most. It is a perfectly overpowering impulse, and I have more than once taken advantage of it. In the case of the Darlington substitution scandal it was of use to me, and also in the Arnsworth Castle business. A married woman grabs at her baby; an unmarried one reaches for her jewel-box. Now it was clear to me that our lady of to-day had nothing in the house more precious to her than what we are in quest of. She would rush to secure it. The alarm of fire was admirably done. The smoke and shouting were enough to shake nerves of steel. She responded beautifully. The photograph is in a recess behind a sliding panel just above the right bell-pull. She was there in an instant, and I caught a glimpse of it as she half-drew it out. When I cried out that it was a false alarm, she replaced it, glanced at the rocket, rushed from the room, and I have not seen her since. I rose, and, making my excuses, escaped from the house. I hesitated whether to attempt to secure the photograph at once; but the coachman had come in, and as he was watching me narrowly it seemed safer to wait. A little over-precipitance may ruin all." "Our quest is practically finished. I shall call with the King to-morrow, and with you, if you care to come with us. We will be shown into the sitting-room to wait for the lady; but it is probable that when she comes she may find neither us nor the photograph. It might be a satisfaction to his Majesty to regain it with his own hands." "And when will you call?" "It is true. And yet -- Well! I wish she had been of my own station! What a queen she would have made!" He relapsed into a moody silence, which was not broken until we drew up in Serpentine Avenue. "Mr. Sherlock Holmes, I believe?" said she. "What!" Sherlock Holmes staggered back, white with chagrin and surprise. "Do you mean that she has left England?" "And the papers?" asked the King hoarsely. "All is lost." You really did it very well. You took me in completely. Until after the alarm of fire, I had not a suspicion. But then, when I found how I had betrayed myself, I began to think. I had been warned against you months ago. I had been told that if the King employed an agent it would certainly be you. And your address had been given me. Yet, with all this, you made me reveal what you wanted to know. Even after I became suspicious, I found it hard to think evil of such a dear, kind old clergyman. But, you know, I have been trained as an actress myself. Male costume is nothing new to me. I often take advantage of the freedom which it gives. I sent John, the coachman, to watch you, ran up stairs, got into my walking-clothes, as I call them, and came down just as you departed. "What a woman -- oh, what a woman!" cried the King of Bohemia, when we had all three read this epistle. "Did I not tell you how quick and resolute she was? Would she not have made an admirable queen? Is it not a pity that she was not on my level?" "From what I have seen of the lady she seems indeed to be on a very different level to your Majesty," said Holmes coldly. "I am sorry that I have not been able to bring your Majesty's business to a more successful conclusion." "On the contrary, my dear sir," cried the King; "nothing could be more successful. I know that her word is inviolate. The photograph is now as safe as if it were in the fire." "I am glad to hear your Majesty say so." "I am immensely indebted to you. Pray tell me in what way I can reward you. This ring --" He slipped an emerald snake ring from his finger and held it out upon the palm of his hand. "Your Majesty has something which I should value even more highly," said Holmes. "You have but to name it." "Irene's photograph!" he cried. "Certainly, if you wish it." "I thank your Majesty. Then there is no more to be done in the matter. I have the honor to wish you a very good-morning." He bowed, and, turning away without observing the hand which the King had stretched out to him, he set off in my company for his chambers. 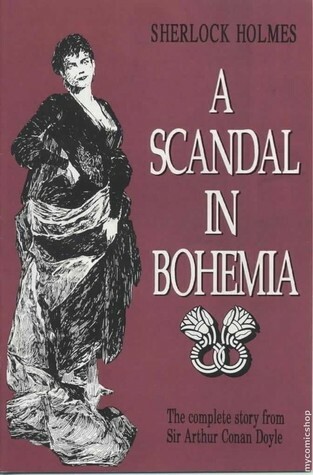 And that was how a great scandal threatened to affect the kingdom of Bohemia, and how the best plans of Mr. Sherlock Holmes were beaten by a woman's wit. He used to make merry over the cleverness of women, but I have not heard him do it of late. And when he speaks of Irene Adler, or when he refers to her photograph, it is always under the honorable title of the woman.